One of Temecula's favorite places to get a sandwich. 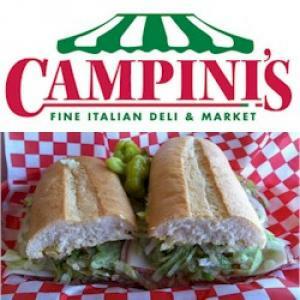 Campini's offers Italian deli sandwiches prepared with premium imported Italian meats, cheeses, and Italian products. They also offer pastas such as ravioli, gnocchi, cavatelli, plus, pizza dough, and a great selection of Italian desserts like Spumoni ice cream, cannoli, eclairs, cartuccios, genovese, napoleons, marzipan, and cookies.